A 45 minute structured (but fun!) session for the independent child aged 3-4 years (based on a school year, September-August). Each week is themed, this gets the children’s imaginations following and helps build excitement in the class. The session begins with a 15 minute warm-up with music and hand apparatus, followed by 25 minutes of exploring gym apparatus and a 5 minute stretch and cool down. This is an ideal class to help children prepare for school and separation from parent. However the adult must remain on site. We have a lovely viewing area that you can sit and watch your little one perform, whilst they feel the security of still being able to see the adult. 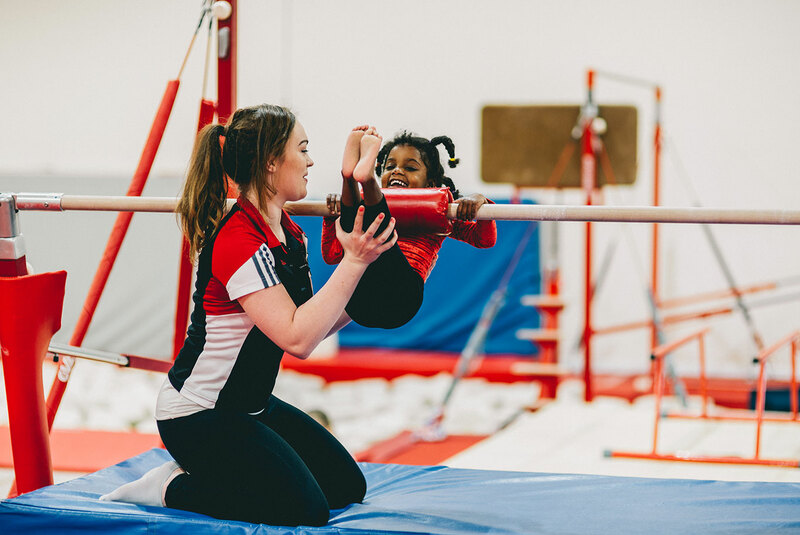 Children will learn the basic gymnastic skills in preparation for recreational classes. Sessions cost £6.05 each paid in a termly amount. Please head to the free taster section to book your space. No need to pay insurance as parent and child sessions are covered under our public liability insurance. Stay for an extra 15 minutes and enjoy a 1 x complementary hot drink, 1 x child’s squash, biscuit and gossip! 10% discount for those who receive benefits. Please email finance@cambridgegymnastics.co.uk and we will arrange a reduced priced invoice after receiving documentation of proof. All data is confidential.